Now available from Spray Nozzle Engineering , the Mini-M70LF low flow spray nozzle ensures maximum cleaning with maximum water savings and as such has achieved a Smart Approved WaterMark accreditation. Smart Approved WaterMark is Australia's labelling scheme for products and services that are helping to reduce water use outdoors and around the home. In order to receive this accreditation, the Mini-M70LF low flow spray nozzle was assessed by an independent technical expert panel against criteria of water saving capabilities, fit for purpose, meeting regulations and standards and environmental sustainability. The Mini-M70LF is a lightweight, easy to handle spray nozzle, designed for heavy-duty cleaning, that ensures consistant spray pattern changes, even at a low flow rate. The Mini-M70LF's 'water shut-off system' provides further water savings by ensuring no water is lost after the trigger is released. Furthermore, a stainless steel seat also stops water leakage at the nozzle seat. 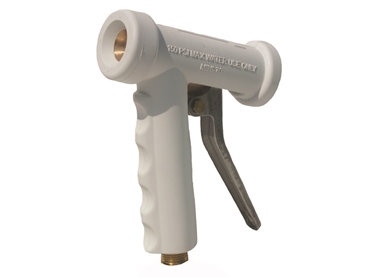 Durability and ergonomics combine in the Mini-M70LF low flow spray nozzle via brass and stainless steel construction, a heavy-duty replaceable cover and a long handle design that allows the nozzle to be held with one hand. A swivel adapter in ½” or ¾” size is included with the Mini-M70LF, and a repair kit is also available.